Erika Bent (APM Agricultural Pest Monitoring Cons. Ltd.) has found cranberry fruitworm (Acrobasis vaccinii ) and cherry fruitworm (Grapholitha packardi ) larvae in highbush blueberries over the past week. 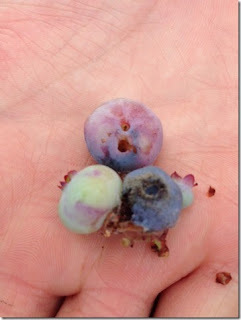 The larvae are feeding inside the berries and will move from berry to berry. If needed, insecticides should be applied this week. We are nearing harvest, so please be sure to check the pre-harvest interval of all products before use. Available products are listed below or can be found in the Perennia Highbush Blueberry Management Schedule. Appropriate resistance-management strategies should be followed. Please consult all labels prior to use for complete use instructions. For cranberry fruitworm apply 2500 L spray volume/ha at egg hatch and repeat 3 times at 4-5 day intervals. For cherry fruitworm apply 1000 L spray volume/ha and repeat at 10-12 day intervals. For best results apply when temperature is 20°C or higher. Cranberry fruitworm: use 1200 to 1500 L spray volume/ha. Apply when insects or damage first appear. Apply 3 weeks before harvest and repeat in 10 days or as necessary. Avoid spraying during flowering. Begin application when egg hatch begins. Apply in a minimum of 187 L spray volume/ha. Do not make more than 4 applications per season. Do not apply more than every 12 days. Do not exceed 640 g product/ha/season. Apply at egg hatch, from petal fall through to green fruit stage in a minimum of 300 L water/ha. Maximum of 4 applications. Best results are obtained if applied in the evening or on a cloudy day. Bioprotec CAF is more effective when no rain occurs within 24-48 hours of application. *Bioprotec CAF: 5-10 days between applications. Dipel 2X DF: 3-14 days between applications. Apply in 374-1122 L water/ha. Apply on a 10-14 day interval with a maximum of 3 applications per season. Use higher rates and spray volumes when larvae are large or foliage canopy is tall or dense. Do not apply more than 6 L product/ha/season. Cranberry fruitworm: apply at the beginning of egg hatch. Repeat applications after 7-14 days if required. Do not exceed 2 L product/ha/year. Apply at initiation of egg laying, make second application at 100% petal fall, and all additional applications at 10-14 day intervals. Apply in a minimum of 300 L water/ha. Do not exceed 4.6 L product/ha/season. Apply a minimum spray volume of 200 L/ha. Do not apply more often that once every 7 days. Do not exceed 645g product/ha/season. Do not make more the 3 applications per season. Do not apply more than once every 7 days. Cranberry fruitworm: use high rate under heavy pest pressure. Re-apply every 7 days, with up to 4 applications per season. Apply in a minimum spray volume of 200 L/ha by ground or 50 L/ha by air. Do not exceed 450 g cyantraniliprole/ha/season.